Reminding listeners of how important it is to be an active part of your community is the purpose of this song from Ghana that is sung at festivals or funerals. 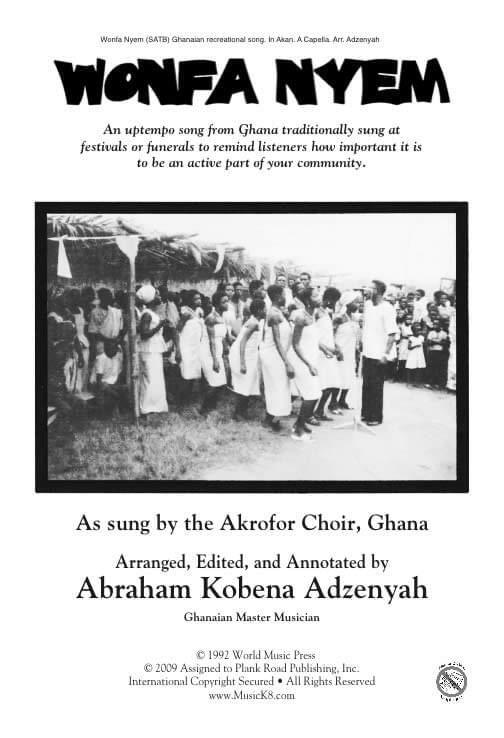 As sung by the Akrofor Youth Choir of Ghana, the arrangement by Abraham Adzenyah has a slow start, and an up tempo second section that is reminiscent of New Orleans funeral processions. It allows for small groups or soloists in simple divisi parts. The song has few words, but it is full of meaning. Includes notes, percussion parts, handclaps, and movement suggestions. Best with grades 9-12. SATB; a cappella.